I recently conducted a search for examples of program-level learning outcomes from a variety of institutions and disciplines. The task turned out to be more challenging than I ever could have imagined, especially from the Canadian context. I firmly believe that every program at every institution should have early articulated and publically accessible learning outcome statements. No one should be left to interpret the intended program learning outcomes from the compilation of courses in the Institution’s academic calendar – faculty, staff, or students (current, prospective and alumni). Nor should these learning outcomes be hidden within reports, to be viewed only by internal and external program review committees. They should inform and bring meaning to our everyday teaching and learning experiences. They should help to create a living curriculum, which is intentional and aligned, as well as continually monitored, reviewed and renewed based on a philosophy of continuous improvement. Here are a few examples of program-level learning outcomes from a variety of disciplines that I came across in my search. 1. Characterize and select materials for design by evaluating the linkages between material properties, microstructures and processing. 2. Analyze materials engineering problems using a balance of mathematics, physics and chemistry including thermodynamics, mass, momentum and energy transport, kinetics and mechanics of materials. 3. Solve materials engineering problems. Identify and formulate problems, develop and apply analytical and experimental methods of investigation, identify contributing factors and generate, validate, and evaluate alternative solutions. 4. Design processes for the extraction, synthesis and processing of materials to meet technical, economic, environmental and ethical needs and constraints. 5. Communicate effectively in a professional environment through technical reports and presentations. Articulate and justify technical solutions to diverse audiences. 6. Recognize and evaluate the societal benefits of materials engineering. Appreciate and evaluate the environmental and societal impact of materials. Recognize the importance of professional and ethical responsibilities, the evolving nature of materials engineering and the importance of lifelong learning. Produce a body of work suitable for seeking professional opportunities in their chosen field of art and design. Solve creative problems within their field of art and design, including research and synthesis of technical, aesthetic, and conceptual knowledge. Communicate their ideas professionally and connect with their intended audience using visual, oral, and written presentation skills relevant to their field. Execute technical, aesthetic, and conceptual decisions based on an understanding of art and design principles. Evaluate work in their field, including their own work, using professional terminology. Recognize the influence of major cultural and aesthetic trends, both historical and contemporary, on art and design products. Learn the professional skills and behaviors necessary to compete in the global marketplace for art and design. 1. Theoretical: Graduates will be able to analyze and evaluate major theoretical perspectives in sociology. a. Graduates should be able to identify the general theoretical orientation. b. Graduates should be able to apply theoretical analyses of social structure and social processes. c. Graduates should be able to interpret social issues in terms of the major theoretical perspectives. 2. Methodological: Graduates will be able to utilize and evaluate research methods and data analysis used in sociology. a. Graduates should be able to demonstrate appropriate use of both quantitative and qualitative methodologies. b. Graduates should be able to evaluate different research methods. c. Graduates should be able to interpret the results of data gathering. d. Graduates should be able to demonstrate appropriate use of statistical techniques. e. Graduates should be able to demonstrate competent use of statistical software. 3. Critical Thinking: Graduates will be able to evaluate critically arguments and situations. a. Graduates should be able to critically evaluate theoretical arguments. b. Graduates should be able to develop evidence-based arguments. c. Graduates should be able to critically evaluate published research. 4. Communication Skills: Graduates will be able to communicate effectively in both written and oral form. a. Graduates should be able to write a research report. b. Graduates should be able to develop an oral research report. 5. Professional Ethics: Graduates will be knowledgeable of appropriate ethics concerning both professional conduct and the use of human subjects. a. Graduates should demonstrate a mastery of the ethical standards for conducting research with human subjects. b. Graduates should demonstrate an understanding of the ethical standards of the American Sociological Association. How do you write a program-level learning outcome? One of the most critical and challenging steps in curriculum development is developing a list of learning outcomes that bring life, coherence, meaning and intentionality to the collection of courses which make up a curriculum. Learning outcomes are broad, yet direct statements that describe the competences that students should possess (i.e. what students should know and be able to demonstrate) upon completion of a course or program (Harden, 2002; Kennedy et al., 2006). They focus on broadly defined complex abilities that can be both demonstrated and observed (Harden, 2002). Learning outcomes may be presented separately to represent the cognitive, psychomotor and affective domains, but often cover a range of interacting knowledge, skills and attitudes that reflect the complexities inherent to the process of learning, and represent the essential, enduring and integrated learning that a graduate of a course or programme should possess (Harden, 2002; Soulsby, 2009). Note: for further details and examples related to the domains of learning see Marzano and Kendall, 2007; Kennedy et al., 2006; Anderson and Krathwohl, 2001; Bloom et. al., 1956; 1964. 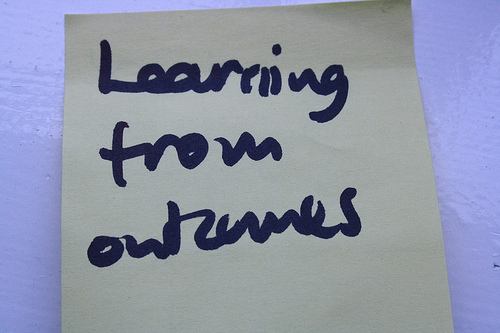 How DO you write a learning outcome? Learning outcomes should state the specific knowledge, skills and attitudes that an ideal graduate of the program should demonstrate, and the depth of learning that is expected. Preparing 8-12 well-written and representative program-level learning outcomes (Harden, 2002) is usually one of the most challenging, yet important tasks a curriculum committee can undertake. It is very important to develop learning outcomes that align directly with program, college and university-level mission statements. Collaboratively reflecting upon and discussing these mission statements is often a valuable first step when developing and/or revising your program’s learning outcomes. The LO should complete a phrase describing what students should know and/or be able to do by the end of the program (e.g. “By the end of this program successful students will be able to…”). The LO should start with an action verb, followed by a statement specifying the learning to be demonstrated, and finally a statement (or statements) to give it context and to identify a standard for acceptable performance. The LO should be unambiguous. Terms such as know, understand, learn, and to be aware of should be avoided, and the specific level of achievement should be clearly identified. Whereas undergraduates may be required to recognize, apply and analyze disciplinary knowledge, graduate students are required to demonstrate a deeper level of understanding, by evaluating and creating disciplinary knowledge. The LO should be measurable, observable, and capable of being accessed. The LO should be balanced. If the LO is too broad it will be difficult to assess, on the other hand if the list of learning outcomes is long and detailed, they are likely too specific and may limit flexibility and adaptability in the curriculum. The LO should be concise and clearly stated. The LO should be realistic given the time and resources available to both learners and instructors. Anderson, L.W. and Brathwohl, D. 2001. A Taxonomy for Learning, Teaching and Assessing: A Revision of Bloom’s Taxonomy of Educational Objectives. Longman, New York. Bloom, B.S., Engelhart, M.D., Furst, E.J., Hill, W. And Drathwohl, D. 1956. Taxonomy of Educational Objectives. Volume 1: The Cognitive Domain. MacKay, New York. Bloom, B.S., Masia, B.B. and Krathwohl, D.R. 1964. Taxonomy of Educational Objectives. Volume II: The affective domain. MacKay, New York. Harden, R.M. 2002. Learning outcomes and instructional objectives: is there a difference? Medical Teacher 24(2):151-155. Kennedy, D. Hyland, A., and Ryan, N. 2006. Writing and Using Learning Outcomes: a Practical Guide. In the Bologna Handbook. 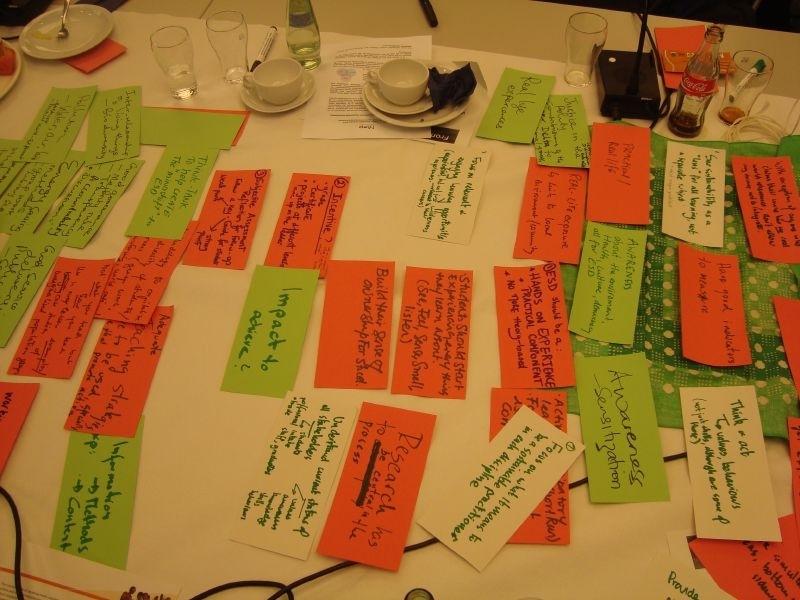 Accessed Online: http://www.bologna.msmt.cz/files/learning-outcomes.pdf Feb. 9, 2011. Marzano, R.J. and Kendall, J.S. 2007. The New Taxonomy of Educational Objectives. Corwin Press, CA.